Milwaukee is the largest city in the state of Wisconsin. Milwaukee is also the 27th largest city in the United States. 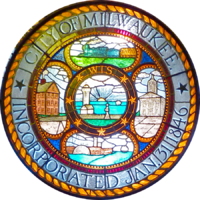 The city is the county seat of Milwaukee County. It is on the southwestern shore of Lake Michigan, and is about 90 miles (145 kilometers) north of Chicago. As of 2009, about 604,133 people lived in Milwaukee. Part of Milwaukee is in Washington County. The current Mayor is Tom Barrett since 2004. The city got its name from the Indian word "millioke", which is thought to mean "the good land" or "gathering place by the water". ↑ Bill Glauber and Ben Poston (June 22, 2010). "Milwaukee sees small surge in population - JSOnline". Milwaukee Journal Sentinel. Retrieved October 5, 2011. This page was last changed on 13 August 2018, at 07:55.